P-SM-5, P-SM-7, P-SM-8 series are specially designed for highly efficient Raman lasers and amplifiers operating in the 1.1-1.6 µm spectral range. 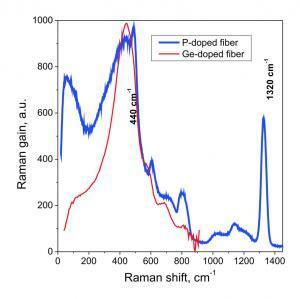 The main advantage of phosphorus-doped fiber is a three times higher value of the Raman shift as compared to germanium-doped fibers. This feature allows one to strongly simplify the Raman fiber laser and amplifier design. For example, to construct a high-power laser @ 1480nm required for pumping Er-doped fibers, only two cascades of Raman wavelength transformation are necessary, whereas six cascades are necessary in the case of Ge-doped fibers.